Golf cart are basically used to travel short distances, they can also be used in different location for different purposes such as resorts, hotels and retirement villages and others. These carts are also used in airports and shopping malls to carry luggage over short distance or inside a building. The participation rate in golf game is increasing due to increasing personal disposable income of consumers and as well as changing life style. Golf is considered as a luxurious game; therefore higher personal disposable income ensures that a greater number of people can afford to play golf. Golf carts are available with various fuel inputs such as electric powered golf cart, gasoline powered golf cart and natural powered golf cart. Due to obvious reason of environmental pollution, electric golf cart is anticipated to be in high demand over the forecast period. The introduction of solar powered golf carts and rising inclination of end-user towards sustainable energy solutions, have propelled the golf carts towards advanced and low maintenance electric golf transformations boosting the demand for electric golf carts. In addition to that, rising international tourism globally is expected to foster the demand for golf electric LSV & carts in airports for luggage and passenger carrying purposes. Golf equipment manufacturers are launching modern and customized golf carts and using advanced technologies, such as computer-aided design and computer-aided manufacturing for developing and modifying their product designs. Manufacturers are increasingly offering solar powered golf carts with high-end accessories, such as golf robots, launch monitors, and remote control capabilities. Moreover, increasing number of golf course globally and rising trend of golf tourism in various developed and developing countries such as U.S., Canada, U.K., Japan, Australia, UAE, India and China is expected to propel the demand for golf carts in near future. The global golf cart market is expected to expand at a CAGR of 6.14% during the forecast period of 2016-2023. The market is expected to witness a robust growth owing to the increasing demand for electric golf cart for various end uses such as hotels, resorts, residential apartments, commercial complex and others. 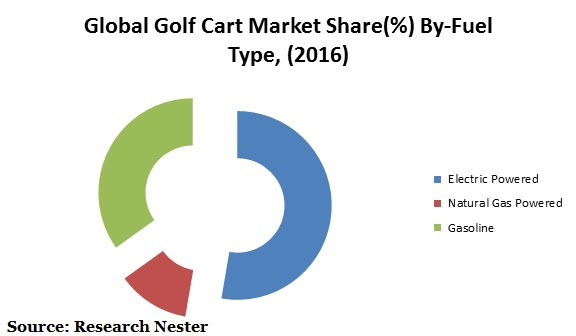 Further, due to heavy demand for eco-friendly product and surging prices of fuel, electric golf cart witness the highest market share of the global golf market. The demand for electric powered golf cart is anticipated to increase in terms of value during the forecast period on the back of low maintenance requirement of solar powered golf carts. These advancements are expected to impact positively on the growth of global golf cart market. Further, the rising trend of golf sports and large scale application of golf carts in hospitality industry is expected to bolster the demand for golf carts during the forecast period. Moreover, Countries such as India, China, South Africa, Brazil, and South Korea have undergone rapid urbanization over the past decade. This swift rise of urbanization and industrialization is expected to boost mall culture, hi-tech and smart housing projects, and amusement and theme parks. All these developments are expected to drive the demand for internal transportation to carry people and goods, thus creating significant demand for golf carts. Furthermore, rapid expansion of urbanization leads to increase in the number of state of the art residential societies with golf courses across the globe. The rising number of golf courses in developing nations such as India, China is impacting positively on the growth of golf cart market. The urbanization is changing the lifestyle of the population and also raising awareness towards the increasing fuel emissions. The rising disposable income of the population is allowing them to spend more on commuting vehicles such as golf carts. However, high cost of maintenance of golf carts which are powered by gasoline is believed to dampen the growth of global golf cart market. Moreover, presence of local manufacturers and lack of standards and regulations is leading the manufacturers to produce low-quality golf carts. Maini Materials Movement Pvt. Ltd.